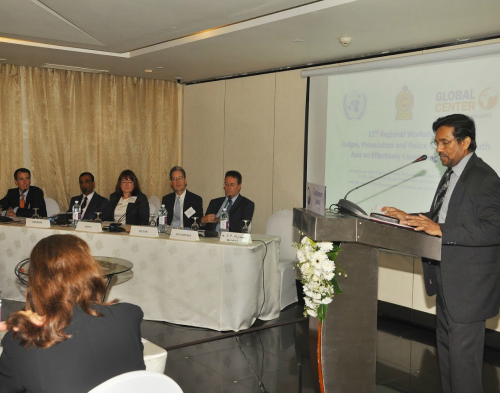 The eleventh regional workshop was jointly hosted by the UN Counter-Terrorism Committee Executive Directorate and the government of Sri Lanka and organized by the Global Center, with the support of the Governments Australia and the United States. The workshop focused on the investigation, prosecution, and adjudication of cases involving foreign terrorist fighters, individuals who travel or attempt to travel to another state to support, plan, prepare, or perpetrate a terrorist act. It was a follow-up to ten previous workshops hosted on a biannual basis in different South Asian countries at which participants indicated the need to examine in further detail areas of mutual interest relating to counterterrorism. The overall purpose of the workshop was to enhance the counterterrorism capacities and improve cooperation among law enforcement personnel in the region. Participants included judges, prosecutors, and police officers from each member state of the South Asian Association for Regional Cooperation (SAARC) as well as resource persons from other UN member states, the SAARC Secretariat, INTERPOL, and the UN Office on Drugs and Crime Terrorism Prevention Branch.